Junior catcher Brandon Chapman stands in the box in baseball's loss to Georgetown Tuesday. Chapman had one hit and an RBI on the night. After dropping a narrow two-run game to Georgetown at home about two months ago, baseball looked to exact revenge on its neighboring rivals on the road Tuesday night. Despite a strong performance from junior reliever Tyler Swiggart and a near late-game comeback, the Colonials (23-23, 7-8 A-10) were unable to get timely hits and fell 8–7 in their final mid-week game of the season. GW’s starting pitcher freshman Emmett Harkins lasted only two-thirds of an inning before being pulled. The Colonials used four pitchers in the first four innings. 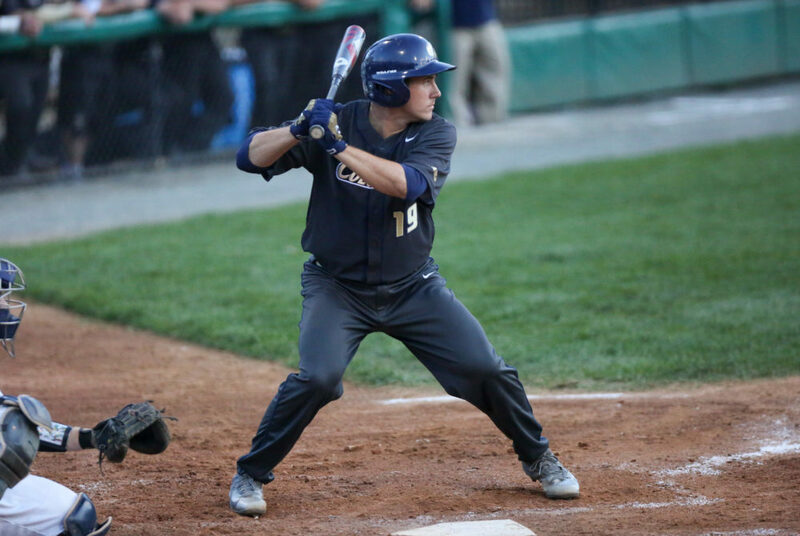 The Colonials struck first as Hoyas starting pitcher Casey Goldenberg got off to a shaky start. In back-to-back at-bats, senior leadoff hitter Joey Bartosic walked and senior outfielder Andrew Selby drove him in with an RBI double. After a fly out advanced Selby to third, senior first baseman Bobby Campbell – who holds a team-best batting average at .354 – drove him in with a single up the middle, pushing GW’s advantage to 2–0. The Colonials strong start was undone by struggles on the mound. Georgetown had 10 hits to GW’s four on the game, a rare outing for an offense that leads the Atlantic 10 in batting average. After Harkins loaded the bases and walked two Hoyas to even the game at two apiece, junior southpaw Kevin Hodgson took over. He allowed back-to-back base hits as Georgetown took a 5–2 lead by the end of the first inning. The left-hander held down the Georgetown bats for two innings, allowing two more base knocks and two walks to load the bases in the bottom of the third. Junior righty Chance Malek then toed the rubber as the third GW pitcher of the night. With two outs, he escaped the jam to end the frame. The Colonials defense limited the damage, making tough outs in the infield despite the absence of freshman starting shortstop Nate Fassnacht. Trailing by four runs, the Colonials did not go away quietly. GW mounted its first comeback of the night in the top of the fourth. Two walks by Goldenberg forced a pitching change for the Hoyas, and junior second baseman Robbie Metz singled to load the bases. A sacrifice fly then drove in GW’s third run. A costly error by Georgetown left fielder Austin Shirley – who dropped a fly ball from freshman designated hitter Steven Barmakian’s bat – allowed the final two Colonial baserunners to score, narrowing the Hoya lead to 6–5. Malek lasted for only one more out, as he continued to struggle to find the zone. After a walk and hit-by-pitch put two runners on base for the Hoyas, catcher Sammy Stevens drove in another runner on an RBI single off Swiggart. Hoyas freshman southpaw Brent Killam threw shutout fifth and sixth innings, retiring six straight Colonials in order. The Colonials found their second comeback attempt of the night in the top of the seventh. Another Georgetown error in the outfield – this time in center field on a routine fly ball – scored two and narrowed GW’s deficit to one at 8-7. Despite Swiggart putting forth a solid outing, with shutout seventh and eighth innings, the Colonials comeback fell short. GW was unable to get anyone across the plate in the final two innings as Georgetown pitchers Nick Morreale and Noah Abdalla put away six of the final seven batters they faced.